Eight young women from eight countries and three continents assemble on the royal-blue hardcourts of Modesto A. Maidique Campus. While only two share a common mother tongue, they all communicate easily over the language of their sport: tennis. Head coach Katarina Petrovic, herself a transplant from Serbia, tells her team to warm up for practice just as the early-morning sun peeks around the Green Library. 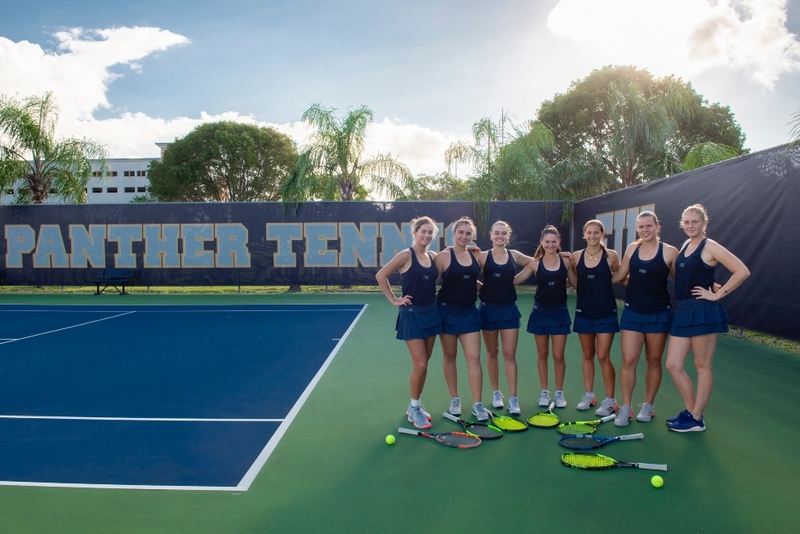 Women’s tennis is the most international sport at FIU—and one of its best. Last year, the Panthers won Conference USA for the first time, and this year they brought in a top-10 recruiting team. Now the players smile through the sweat as they jump rope in the 85-degree October heat. was talented enough to pursue an individual professional tennis career full-time in her own country immediately after high school. Instead, they chose to join the Panthers. Aside from the camaraderie and expert coaching, education is a major incentive to play for FIU. Overseas, it is nearly impossible for students to pursue both their study of choice and a career in tennis. The players face some challenges when they first arrive. Like any freshman, they get lost in the city-like landscape of campus. Not always fluent in English, they sometimes find academic assignments difficult. Luckily for them, FIU has a commitment to preparing competitors to excel both in and out of the classroom. With access to tutoring and study hall sessions at the Student-Athlete Academic Center, and professors generally willing to go out of their way to answer questions and assist as needed, the team members do exceedingly well: Last season they collectively earned the highest average GPA of the 14 women’s tennis teams in Conference USA. Petrovic also helps get them acclimated and comfortable. One tradition: a team meal enjoyed once a week at a player’s dorm. Petrovic also has a positive coaching style that brings the team together.